Home Good Books What If It Fails? Last week I began a grand experiment. 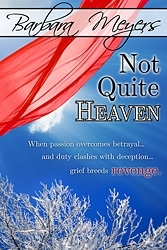 I self-published my book, Not Quite Heaven in digital format, offering it for sale on Amazon.com, BarnesandNoble.com and in the iBookstore. After years of pooh-poohing self-publishing, suddenly it seemed like a very appealing idea. Why? Because I kept hearing from other authors that by making their books available to readers, they were getting recognition and making their mortgage payments with the income their eBook sales provided. Some of these were previously unpublished authors or authors publishing their long-out-of-print backlists. What did I have to lose? I was already published in romantic fiction. I had a web site in place and a blog and a Twitter account. Facebook friends. I also had a completed manuscript for a book I loved but my editor hadn’t wanted. What did I have to lose? I made a relatively small investment in professional cover art, paid a small fee to have the book formatted because I couldn’t seem to format it correctly myself. Next thing you know, Not Quite Heaven is out there in the universe for anyone with the ability to download an eBook to see. Next came the doubts. What if no one’s buying it? What if no one wants it? X number of million Kindles, Nooks and iPads have been sold in the past year or two. My best friend has been using her phone to download eBooks for longer than that. But still, the thought haunts me. What if no one wants Not Quite Heaven? What if I get my first sales reports and I’ve sold exactly zero books? Should I stop writing because (sniff, sniff) no one wants my book? If that were the case I would have stopped writing a long time ago when it became clear to me that agents and editors weren’t interested in representing or publishing my work. Maybe if I’d understood that whole goal/motivation/conflict thing earlier, I’d have sold more books through traditional channels. But I didn’t understand it until much later, so I’m offering this particular book for sale in what may very soon become the new traditional channel. If no one buys it I will learn a lesson from my experiment, another in a long line of lessons I’ve had to learn from the moment I began writing fiction. I’ll have to figure out what I’m doing wrong or how to market it better, or how to increase traffic to my site or how to get the word out there: If you enjoy reading romance, you’ll enjoy this book! During the editing process, I gave a nearly final draft to an avid reader I’d met a couple of years ago at a booksigning for A Month From Miami. She lives in my town and instead of asking another writer to do a final read-thru, I asked Tara. When she finished she called to tell me “I loved it. You’ve got a winner here.” Those are words that will warm any author’s heart, and I take them with a grain of salt every time I hear them because I know readers don’t want to intentionally hurt an author’s feelings. When I saw the work Tara had put into my manuscript and the several times she highlighted sections with the comment “This bugs me” I knew I could trust her honesty. Because she reads so much romantic fiction, she knows what works. For similar readers, I’ll just say this: Not Quite Heaven might be the best book you haven’t read. Yet. barbara meyers, eBooks, not quite heaven, Reading, Romance, self-publishing, writing. Bookmark. Then I know I’ve sold two because my friend Eileen said she has it on her Nook and is reading it. Yay!